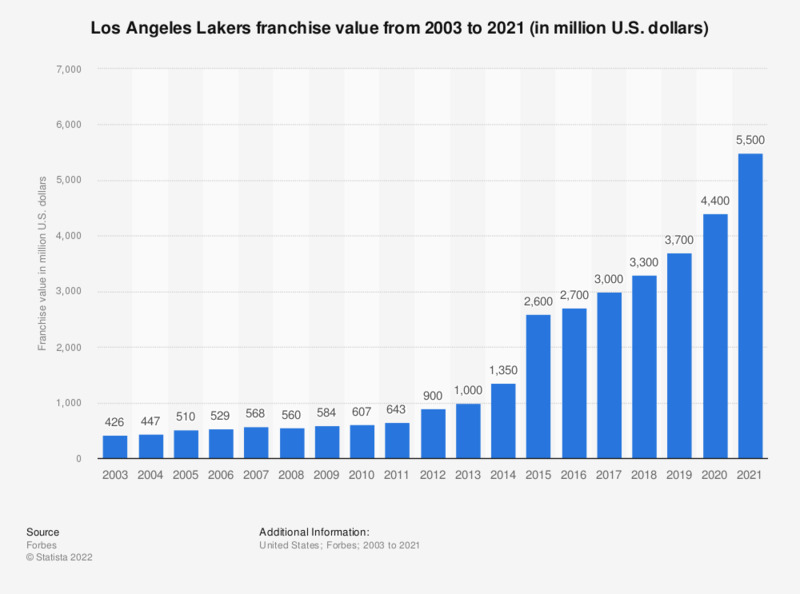 This graph depicts the franchise value of the Los Angeles Lakers of the National Basketball Association from 2003 to 2019. In 2019, the franchise had an estimated value of 3.7 billion U.S. dollars. The Los Angeles Lakers are a professional basketball franchise of the National Basketball Association (NBA) that is part of the league’s Western Conference. The team was started in 1947 and originally located in Minneapolis, Minnesota. Prior to the 1960/61 season the franchise was moved to Los Angeles. Today the Lakers play their home games at Staples Center, which is located on Downtown Los Angeles and has a capacity of about 19 thousand for basketball games. In the 2013/14 season the Los Angeles Lakers had an average per game attendance of 18,828 with a total attendance of about 772 thousand. Tickets to Lakers home games cost 102.25 U.S. dollars in 2014/15 according to Team Marketing Report’s Fan Cost Index. The overall league-wide average ticket price was at 53.98 U.S. dollars. Forbes ascribes the franchise a total value of 2.6 billion U.S. dollars in 2015, an increase in value of 95 percent compared to the previous year. The Los Angeles Lakers are one of eleven franchises that are currently valued at one billion U.S. dollars or more. On average, NBA teams had a value of 1.1 billion U.S. dollars in 2015 according to Forbes. The revenue of the Los Angeles Lakers was at 293 million U.S. dollars in the 2013/14 season. The Lakers are one of the most successful franchises of the National Basketball Association with a total of 16 championships under their belt. Only the Boston Celtics have won more titles with a total of 17. Some of the best players ever, such as Jerry West, Earvin ‘Magic’ Johnson, Wilt Chamberlain, Kareem Abdul-Jabbar, Shaquille O’Neal and Kobe Bryant have played for the Los Angeles Lakers franchise. * Value of the team is based on current stadium deal (unless new stadium is pending) without deduction for debt (other than stadium debt).